It all starts with a great voice! 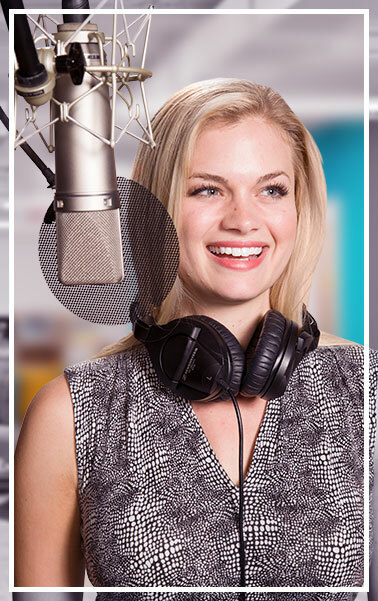 We have a pool of some of the industry's top professional Voice Talent available to record your voiceover. Secondly, but just as important, is the recording and processing of the sound files. With our state of the art recording studios and highly capable engineers, Amazing Voice is well equipped to deliver recordings of the highest quality possible. All voices are recorded in sound–proof isolation booths (for maximum signal to noise ratio) with professional grade Condenser Microphones. The audio is rendered digitally – in high resolution – with a sampling rate of 44kHz (industry standard). This ensures the highest possible sound quality right at the source. Limited processing may also be applied during recording to control the peaks while maintaining a consistent, even volume. Once our professional Voice Talent have successfully recorded your script, all files are then subject to our processing stage. Using state-of-the-art equipment/software, each order is equalized (adjusts the tonal quality), compressed (evens out the volume/consistency), maximized (for optimal volume) and a noise reduction filter is then applied. We have access to a number of processing tools that can clean, fix, change, re-model, augment or otherwise customize your voiceover as you require. All recordings are then mastered by our expert audio engineers. Audio files are meticulously hand-edited, noises are removed, breaths are attenuated (or removed) and all pauses, including the head & tail of each file is adjusted for smooth playback - resulting in crystal clear voice overs. This last step is crucial in the process and is often overlooked. If not done properly and with high-end equipment/software, the resulting files could deteriorate drastically and produce unwanted noise artifacts. Over the years, Amazing Voice has spent countless hours analyzing and perfecting their conversion process. We have developed a unique and elaborate method that produces outstanding results every time. The bit depth, sample rate, file format and file extension are also defined and saved at this stage. The files are now ready to be played back on your system. "Quick service and professional quality. An excellent value all around. "